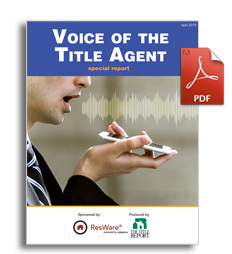 For the 9th consecutive year, The Title Report’s Voice of the Title Agent special report provides insight into what’s really going on in your industry. This past year the Consumer Financial Protection Bureau has come under control of a new director in Kathy Kraninger, and the proposed acquisition of Stewart by Fidelity has run into a roadblock. Agents have a heightened awareness of wire fraud, as new technologies try to solve the problem, and there’s never been a more important time to hear directly from title agents. Thanks to sponsor Adeptive Software, the 20-page special report is offered as a free download. What is your best opportunity? Is enough being done to prevent fraud? Will CFPB leadership changes impact your business? How nervous are you about agent vetting and lender oversight?